Perhaps taking a well-deserved rest from the gruelling hours of filming has had a positive impact on Zhao Liying and Yang Mi. Both recently attended a presscon for their respective endorsements decked out from head to toe with even more designer brands. The two ladies are rocking variations of a dainty off-shoulder dress. Inasmuch as I want them to be in another drama, It's nice to see the actresses simply being themselves and taking a breather. Zhao Liying's The Story of Minglan just entered post-production while Yang Mi's Legend of Fuyao which wrapped last year may hit the small screen a little sooner. 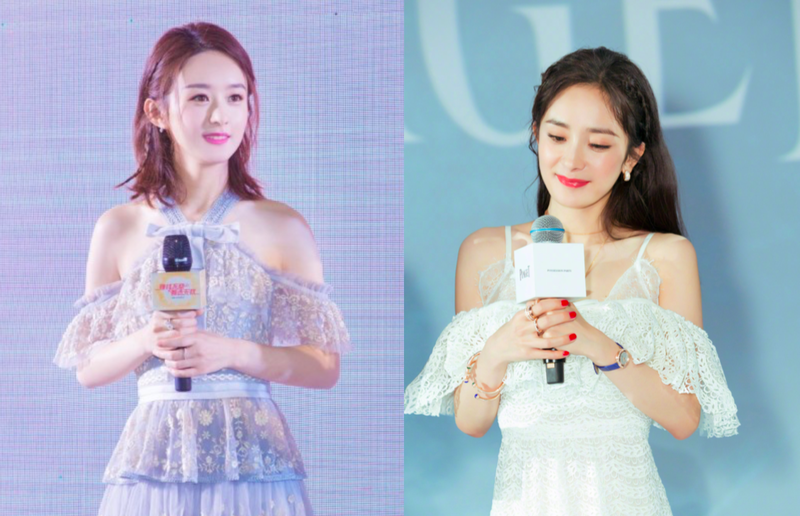 Both ladies r beautiful in their off-shoulder dresses, they're both almost about the same age but Yingbao looked like she's in the mid-twenties. Completely agree! However when she was in her very early twenties she looked near thirty. Does her chin seem to change recently? Seems somewhat longer and the angle of mandible is gone. I think she looked quite a bit aging the last time I saw her in a pink dress that showed her scar in the back, right before she took a break. She lost a crap load of weight for Princess Agent. I miss ZLY with long hair.